The Sakurajima volcano, Kagoshima, southern Japan, is one of the most active volcanoes in the world and has gone through large Plinian eruptions such as in 1471, 1779 and 1914. In recent years, the volcano repeats Vulcanian – violent but relatively small and short – eruptions. The geodetic data indicates that substantial amount of magma comparable to that of the 1914 eruption has already been accumulated in a deeper magma chamber about 10 km beneath the Aira Caldera. A joint research team consisting of Tohoku University, the University of Tokyo, Kyoto University, and the Geological Survey of Japan, AIST, has estimated the depth where the magma was stored just before the three Plinian eruptions based on detailed chemical analyses of the phenocryst-hosted melt inclusions and plagioclase phenocrysts. The result demonstrates that voluminous magmas were stored in the conduit at a depth of 1 to 3 km below the surface just before the eruptions, not in the deeper reservoir of 10 km deep as has been assumed. Providing that a similar precursory process will take place in a future event, a Plinian eruption will occur in a short time when a large amount of magma precedentially fed into the shallow conduit starts ascending. Further study on magma plumbing system will be useful for the mitigation of the damage from volcanic eruptions. The result has been posted online (Scientific Reports, https://www.nature.com/articles/s41598-019-38494-x). 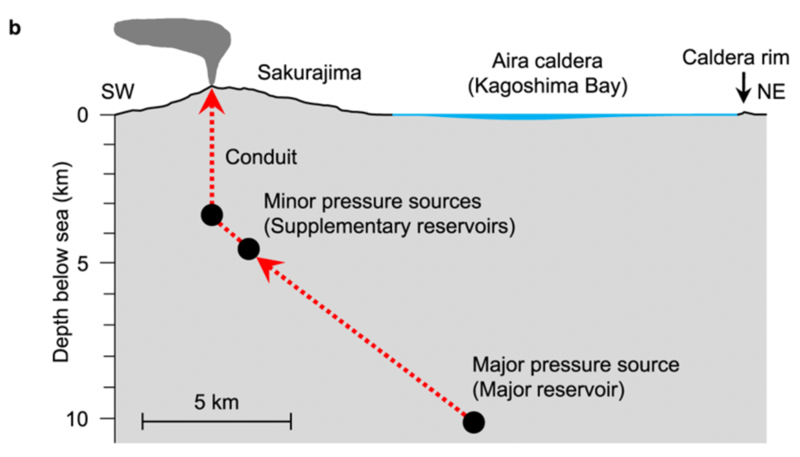 A schematic illustration of the present magma plumbing system of the Sakurajima volcano. Black circles indicate pressure sources for geodetic deformation, which are assumed to correspond to the positions of magma reservoirs (Cited from Scientific Reports, 9, 1979, Figure 1b).